>OK, enough about clothes and yoga. I spent Sunday at the Pike Place Market, unquestionably the highest concentration of gourmet comestibles per square foot in the city. Nina and I started with brunch at Cafe Campagne, a place that preserves an old-fashioned French urban vibe: Old room, old furniture, everything gleaming and golden and just a bit fussy. The service is attentive and professional and the classic, unabashedly rich food is a relaxing exception to the assemblages of politically correct pedigreed ingredients that are currently in style elsewhere. After brunch we popped into Rose’s Chocolate Treasures to buy truffles and ooh and ah at the antique hot chocolate sets for sale (these look like tea sets, except both the pots and the cups are tall and narrow). 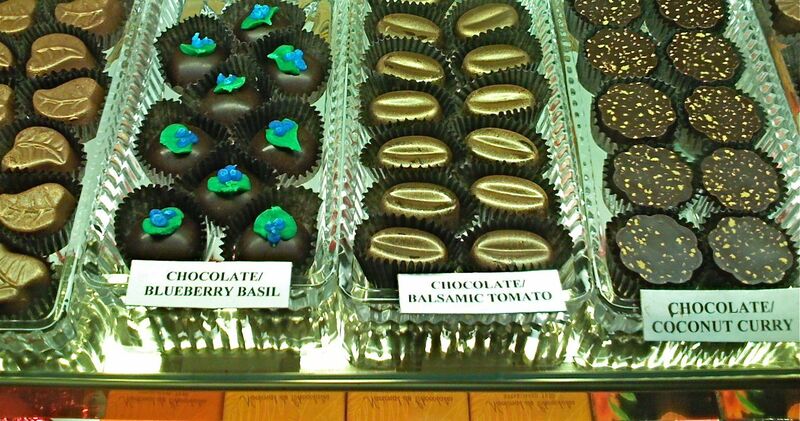 No, I didn’t try the chocolate blueberry basil or the chocolate balsamic tomato truffles pictured here. I had the “plain” toasted coconut truffle. Next stop was the Perennial Tea Room to buy Yorkshire Gold breakfast tea. 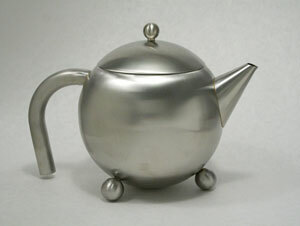 They have an extensive display of Henley stainless steel teapots. Pick one of these mid-century modern pots up by the odd-looking handle and you realize that this is not a teapot that is going to pull forward or tip when filled with water. It’s beautifully designed. The painted ones (bright colored pots with stainless feet, spouts, lids, and handle) were in a two-cup size but the plain stainless one comes in four sizes, all the way up to a 53-oz. “family” size (at left). The Perennial Tea Room is one of the area tea organizations sponsoring a Northwest Tea Festival in the fall. Details to come at the website. This entry was posted in Uncategorized and tagged Cafe Campagne, Perennial Tea Room, Pike Place Market, Rose's Chocolate Treasures, tea, truffles. Bookmark the permalink.